Radiotherapy procedures use sources different variety of sources with different activities. These procedures require personnel protection from primary sources such as beta’s, gammas, x-ray photons, and secondary scattering radiation. 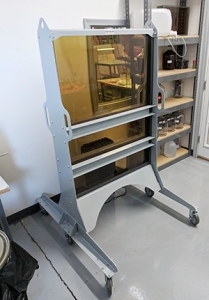 A ClearView Radiation Shielding window is mounted on a frame on casters to protect against betas and gammas from radioisotopes used in radiation therapy and cancer treatment. The housing for the shielding with be fabricated out of impact resistant clear polycarbonate. The frame is constructed of lightweight aluminum with powder coat paint. 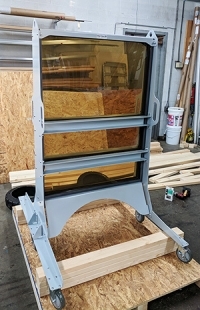 The frame has handles for ease move handling and moving the rolling shield. The casters rotate 360o for ease of rotation with minimum footprint. The viewing window dimensions are designed to fit the applications and requirements. This design provides a large viewing window while protecting hospital staff and family members from Co60, Cs137, I131, Sr89, Y90, high and low energy X-rays, etc. used inpatient treatments. According to the American Society of Therapeutic Radiation Oncology (ASTRO), patients treated for a rising Prostate Specific Antigen (PSA) level requiring postoperative radiotherapy, get a cumulative dose in range of 60-65 Gy. It is undesirable for physicians and hospital staff to be in the room during and after some of these procedures. Procedures such as MIBG Radiotherapy which treats Neuroblastoma (solid tumor) in young children as young as 3 years, use I131 between 250 mCi and 1200 mCi. Post procedure, the child has to remain confined in a room alone for 3 – 5 days and interaction between the child and doctors, hospital staff, family, etc. is limited to 20 to 40 minutes in a day. Having a transparent rolling shield is very suitable and ideal in such scenarios. Standard thicknesses (Gamma protection) – 0.5’’, 1.0’’, 1.5’’, 2.0’’, 2.5’’, 3’’. Standard Dimensions – 1’x1’, 2’x1’, 2’x2’, 3’x 3’, 4’x 3’. ** Testing performed at Nuclear Medicine department at University of Wisconsin – Madison. *a Testing performed at Carbone Cancer Center at University of Wisconsin – Madison. *#Co-60 – Testing using ANSI / HPS N 13.11 Standard. DOT (US), IATA, IMDG certified non-hazardous and environmentally friendly. Does not create internal sources of radiation. Non-toxic, non-abrasive to human contact. Radium Incorporated increases a worker’s quality of work, safety, and productivity while reducing exposure (ALARA) and costs in the nuclear and medical industries. Radium is focused on exceeding our customers' expectations.